Those who think of fitness and / or strength training, think of rubber weight plates. Rubber discs are indispensable for performing exercises such as the squat, deadlift and bench press. 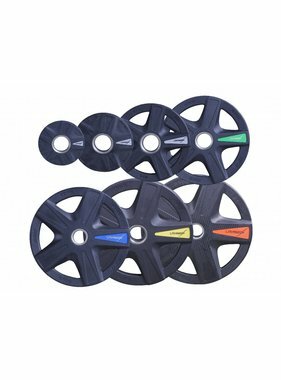 Our rubber discs have a diameter of 50 mm and are coated with durable, high-quality rubber. This makes our rubber discs suitable for intensive and commercial use. The rubber discs can be combined with the 50 mm barbell. In addition, the discs are equipped with multiple handles, making them multifunctional to use. Our rubber weight plates are available from 1.25 kg up to and including 25 kg. So there are always discs in our range that fit the goals of you and/or your members. Do you have questions about our rubber weight plates? Then contact us. We are happy to help you!